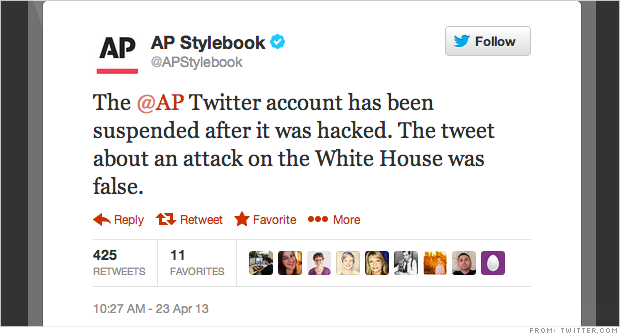 The AP confirmed with another tweet that their account was hacked and the news from the White House was false. (CNN) - Last week, a fake news story got tweeted from a hacked Associate Press twitter account. Within about two minutes, the stock market sunk over 100 points, but then came back to the surface soon afterwards. An event only made possible by the speed and robotic actions of High Frequency Trading. Much of the quick back-and-forth trading that swings the market up and down is done by computers. Thousands of trades happen every second. It's because companies have created algorithms to scour the web for information on the market and then acts on that information, in the form of automatic trading. [2:13] "Algorithms go in and parse the news article for these positive and negative words and they literally count how many words are positive and how many words are negative. That's how they determine the sentiment." Sure, this process keeps the market moving at an incredible rate, but how fast is too fast? The Commodity Futures Trading Commission this week took up the topic as it tries to figure out how to factor in technology and its effect on trading. [5:01] "I think that's possible, but it's like everything else. If you look at the history of our country and this history of how we generally operate, we don't generally change until we are faced with some kind of a crisis which forces change. And the way we're set up is entirely conceivable unfortunately."